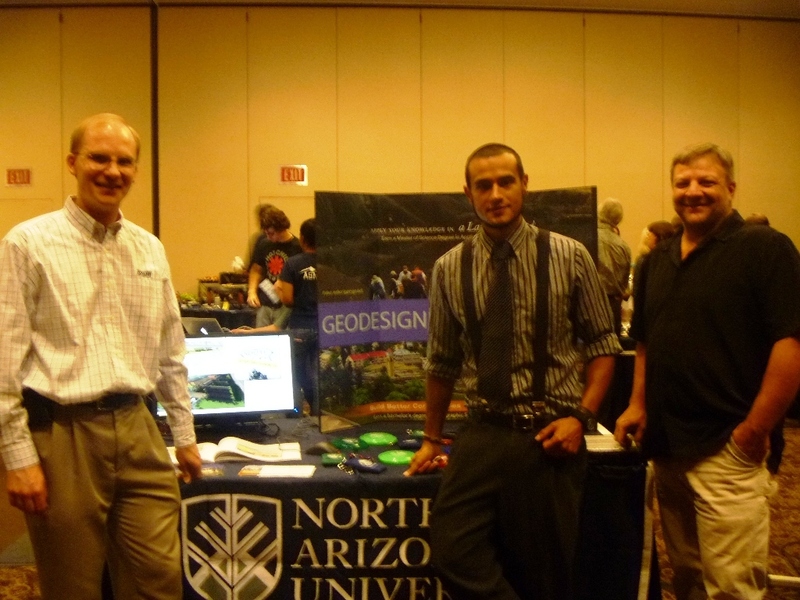 Progress and stories related to our Geodesign-oriented major at Northern Arizona University. Posted by Tom Paradis, NAU. Apparently the concepts of Geodesign are gaining the attention of students as well as faculty and employers. During fall, 2012 my colleagues and I were pleased to see some of our undergraduate students in geography and planning take the initiative to found a new student organization here at NAU (with no initial prompting from us!). They settled on the professional-sounding name of Geodesign Student Group, which has already hosted several activities that include local field trips and guest visits by local and regional planners. They have also been visiting classes to secure contact information from potential new recruits. If you were at the recent Geodesign Summit in January, you may have seen some of them attending your sessions. Perhaps they can provide inspiration for other students elsewhere in the future! If you would like to see what they’ve been up to, here are some materials that they have created, including a web site, blog, Facebook page, and a feature article on the NAU homepage a few weeks ago. Our goal is to help them become sustainable so that future students will build on their excellent efforts! 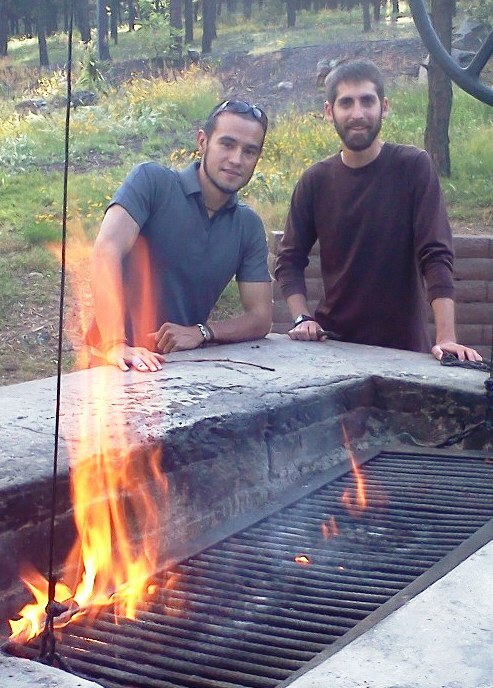 GSG members took the lead on our department BBQ. The past several months have seen some encouraging developments here at NAU, with respect to our efforts to find a space suitable for collaborative learning and student design projects. I suppose the primary lesson emerging from our experiences is the potential significance of “seed money” and leverage, whereby one small success can lead to others. The remainder of this post will provide an overview of this “snowball” effect that we have experienced in the past few months in our effort to secure a space for a new geodesign studio. The future NAU Geodesign Studio space, Room 117 SBS West. 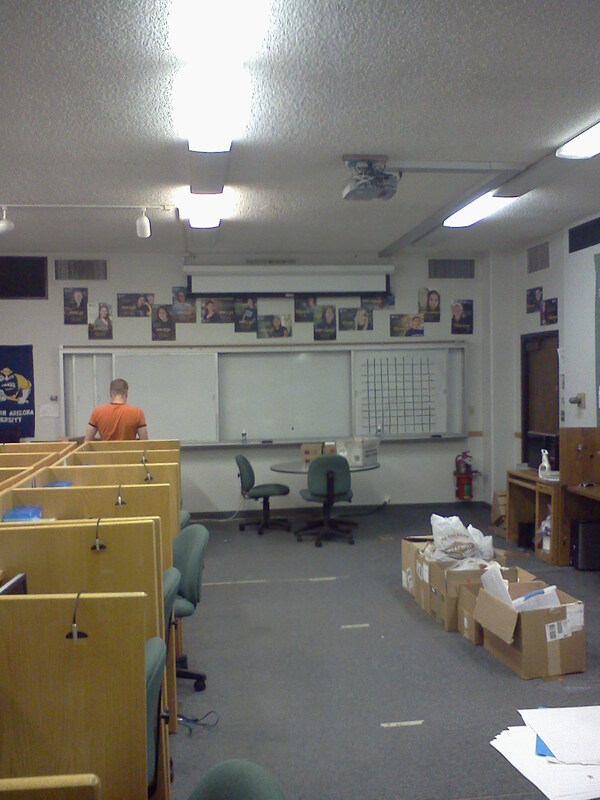 The Call Center is preparing to move out, pictured here, of the 24 x 34-foot room. First, however, let’s take a look at the space. Our Department of Geography, Planning and Recreation landed what I call the “Cadillac” of rooms under consideration for a new studio, either within our building or nearby. In short, the room served as the former “ATT Lab” for the former College of Business before they moved into their new facility down the road seven years ago. The room is still labeled as such on the doorways. Then, the NAU Student Call Center moved in, from where eager student volunteers called potential alums to assist with NAU development efforts. Although our department is not seeing its own new building any time soon, we are indirectly benefitting from the campus building boom that continues at a record pace. As I write this, the Call Center is moving into its new facility on north campus, leaving us a pretty ragged, but exciting room (see photo above). The University Space Committee has since turned the room over to our department, with our planned opening date (knock on wood) of January 14, 2012, when the spring semester begins. It was a bit of a strange and satisfying feeling in August when we began to place Room 117 (the Studio) into our course scheduling matrix, which means that it is becoming the official classroom space for our GSP 405 capstone course, Senior Professional Studio. More courses and projects will be scheduled for that space in the future. Making the project more real (and not just a little intimidating for this new chair) was the fun had by colleagues yesterday while choosing a carpet design from swatches provided by NAU facilities. The room desperately needs new carpet and other upgrades, which will happen care of the dean’s generosity and support for the project. How did we acquire the space and support for upgrades and furniture? One success has led to another, the proverbial “snowball” effect. A bit of good timing hasn’t hurt, either. Long story short, the process began last spring with the submission of a written proposal to the NAU Parent Leadership Council, which provides mini-grants for curricular projects that will benefit the students beyond what is normally supported by academic units. I called our dean (since departed from NAU) and secured his verbal support for submitting the proposal for some new computer equipment, for a then-imaginary studio room. He told me that, if we secured the grant, he would help us find some space. Upon news of our success with obtaining the grant, it was time for the dean to make good on the promise. Let’s just say that it was not an easy process, and I sympathized with the dean who was already desperately looking for space for many other college needs. Having all but given up on options within our own building, he opened the door by suggesting a trade. Something akin to “Trading Spaces,” our department collaborated on a proposal to consolidate some office spaces that could be traded back to the college for use as new faculty offices. That second proposal, along with unanimous faculty support and some plans for room juggling, landed us the studio space by early summer. Since that time, a lot of exciting planning and design work has ensued, providing fodder for future posts here. The latest success has been our Provost’s granting of funds to furnish the studio, the final piece of the equation for now. If we can get the carpet and walls renovated over the holidays as planned, we may just have students in there on January 14! Tom Paradis, John Baskett, and Mark Manone (left to right) present the studio progress at the annual Parent Leadership Council reception in September. 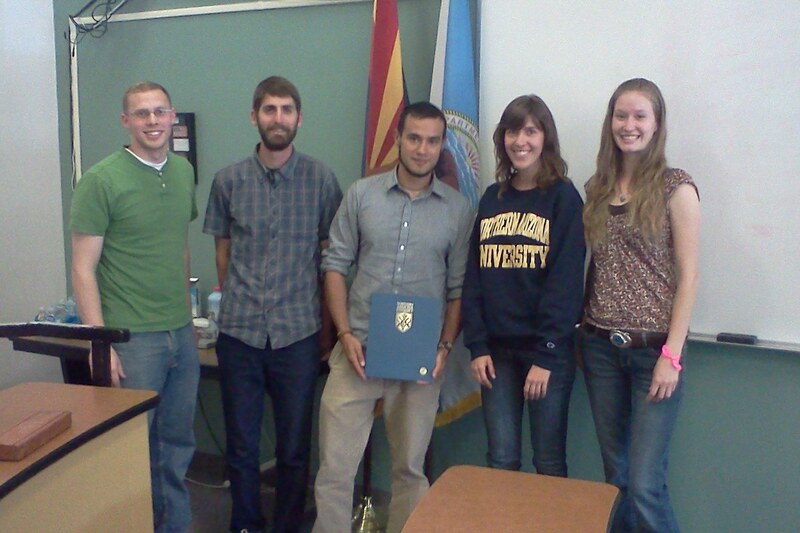 John is a founding member of the Geodesign Student Group at NAU. Posted by Tom Paradis (with great assistance from others mentioned herein). Still, it seemed possible that some version of a geodesign “lab” might be the next obvious step for our students and faculty – some collaborative and dedicated space where geodesign can “happen”. Lacking imagination or decent experience, I had conceptualized the “lab” as a room full of computers and a projector. Ya, we got that. But what exactly would happen with geodesign in such a place? I brought such questions to my colleagues, and we did the next logical thing: consult with Bill Miller, Director of GeoDesign Services at ESRI. Long story short, thanks to Bill’s assistance and experience, we began to visualize a very different kind of place. Not a lab, per se, but a “studio,” similar to what might be found at many architecture schools and programs. Less computers and more supporting infrastructure. Some of the studio components could be refreshingly simple, from rolling tables and chairs to white boards and tack boards or “cork bands” to pin up posters and drawings. Fortunately, one of our urban planning faculty members, Dawn Hawley, was in sync with this concept due to past experience at other universities. The rest of us geographers and planners had to wrap our heads around it. With Bill Miller’s perspectives in mind, my colleagues provided a new vision for a Geodesign Studio, a space where students could enjoy their own, dedicated space for specific design-related courses. They could store posters and projects instead of bugging faculty members to hide them in their offices (happens frequently now). The room would not be “open” publicly, but actually secured for limited entry, including lockable cabinets and lockers on the inside, and a key-pad entry on the outside. Students in specific studio/design courses, consequently, could feel comfortable with using the space without fear of materials being stolen. Posters and draft site plans could be displayed, with multiple students pouring over draft materials around a table. GIS and SketchUp projects, for instance, could be displayed electronically overhead, and tweaked on a shared computer or tablet PC, for instance. Student teams from the classes could meet here and complete their team projects, and even personalize their space a bit. A limited number of cubicles and desks would be available to allow for individual work space. This type of space made sense to us, comprising much more of a “studio” than a “lab”. The timing seems to be right. Our department submitted a proposal for an internal mini-grant that has recently been accepted (Thanks to the NAU Parent Leadership Council! ), which will allow for the purchase and upgrade of a few computers and initial equipment. Given this recent success, some matching equipment has been secured, and our college Dean has promised to help us find some adequate space (no easy matter, and still to be determined). It appears that with these three symbiotic components – space, small grant, and matching equipment from existing inventory – this will provide a reasonable and feasible approach to get us started! I suppose the lesson here is that one can start small, secure some initial support and materials, and plan to build on that for the future. A Geodesign Studio need not be complicated or reserved for the most well-funded institutions. There are certain things that can be accomplished relatively quickly with limited funding. Now the work begins…. Input for us and others? How might you adjust the Wish List above? Or the vision? Your experiences with studios that might apply to geodesign goals? Feel free to comment, as we are always looking to learn and share ideas for this venture!